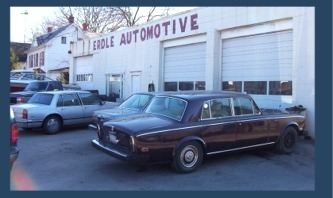 Hello, and welcome to Erdle Automotive and Marine, serving people and machines in Central Maryland since 1975. We specialize in custom auto repair and servicing. Our expertise is in finding that "hard-to-find" part or service for both domestic and foreign autos. We also specialize in marine engine and transmission repair and service. If your boat is too large to drive to our shop we can come to your boat. Our travel rates are reasonable and our service is excellent and complete. Our motto is "no unsatisfied customers" and at a reasonable price. Erdle Automotive & Marine has many repeat and satisfied customers in Central Maryland and all up and down the East Coast. At Erdle Automotive and Marine we specialize in servicing vehicles that are hard to find parts for and foreign and domestic autos that normal repair shops cannot handle. Or expertise extends to diesel repair and normal service and we are adept at servicing older model Mercedes Benz and other European makes and models. In the past we have seen some very exotic cars brought to us for repair and servicing and we were able to do what was needed on all of them. Erdle Automotive & Marine has been servicing boats and related equipment for many years. Our primary expertise is in marine engine repair, both gasoline and diesel. Boats that can be trailered are brought to our shop for servicing. Larger boats are serviced at the dock where they are berthed. We can travel to any location in the Central Maryland area that is accessible to us. Our rates are reasonable and our service is excellent. If we can be of service to your boat please see our Marine page or give us a call at: (301) 840-1988.